Priti launched the Get Witham Working campaign to help get more local residents into employment, apprenticeships and training. Back in 2010 there were around 1,500 unemployed Jobseeker’s Allowance claimants in the constituency, with the number doubling over the previous few years. To support local people into work Priti organised Jobs and Apprenticeship Fairs in Witham with local and regional businesses and training providers. 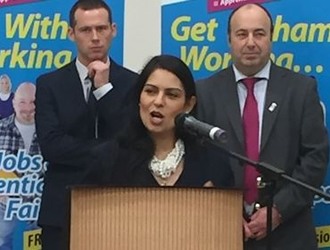 Priti’s Get Witham Working campaign was supported by the then Secretary of State for Work and Pensions, the Rt Hon Iain Duncan Smith MP, who attended the 2014 Jobs Fair. The claimant count in the Witham constituency is now at around 670 (September 2018). Priti continues to engage regularly with schools, training providers and businesses to support new employment and apprenticeship opportunities and the creation of new jobs in Witham.